and electronics; extending the low-frequency response, generating huge impact adding to the excitement of listening. Able to meet any requirements, the Prima subwoofers are available as a “Loaded Enclosure” or “Components”, expanding the possibilities for specialists to create their one of a kind system. Prima subwoofers are designed for maximum performance when used with AP amplifiers. 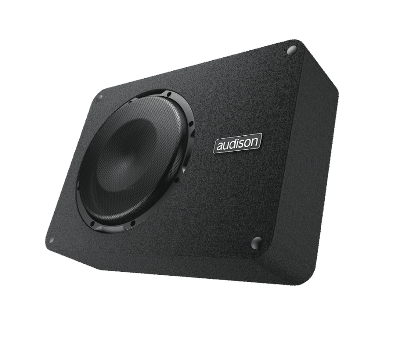 They work in perfect synergy with their native electronics, taking advantage of their on-board DSP to blend the subwoofers low frequency extension with the rest of the system. The Audison R&D staff focused much of their energy on simulation and the measurement of low-frequency acoustic response in different cabins. Measurement analyses combined with acoustic simulations and listening tests ensured the definition of the best characteristics for both enclosures and components with one target in mind: to maximize performance using all the available power while maintaining a compact enclosure. The Prima loaded enclosure design came from an essential concept: adaptability to all installation needs. Every detail was designed to facilitate the integration of the enclosure in the car, with Hi-Tech features and cosmetic finishes. • The 2S²- 2 Sides /2 Sounds feature provides levelling feet with velcro inserts for a secure grip with the carpet while maintaining easy removal. • The SSP-Sub Smart Plug terminal block offers multiple connectivity options and the ability to quickly and safely remove the enclosure. • Rounded corners allow easy positioning in the trunk and act as reinforcement to reduce enclosure resonance. • The sturdy metal grid ensures total protection of the subwoofer.